Llangrannog is a wonderful little fishing village in Ceredigion on the Welsh coast. This unspoiled coastline is glorious – just like Cornwall, but without the crowds and commercial hype. Maybe like special Cornwall in the pre-A30 days, when the weary traffic-jam journey over the Tamar past overheated cars stalled on the roadside meant it wasn’t worth bothering unless you had a fortnight to spare. So come to Llangrannog to relax, to breathe, to escape the tourist trail, to be the only person making footprints across the beach. Yes, it’s a long drive across Wales. But when you smell the salty sea air and crest the last hill to see the impossibly blue sea ahead of you, the winding Welsh roads become all part of the adventure. The hill will drop you steeply down into Llangrannog village. You’ll find yourself already craning to see if it’s a day for white horses giving surfers a thrilling bronco ride, or a day for spotting dolphins curving gracefully through calm waters. That’s one of the joys of this fabulous coastline. You don’t know if you’ll wake to crashing rollers, daring adrenaline-junkies to don wetsuits and dash to the sea with surfboard or bodyboard, or a tranquil scene of blue and gold tempting you wander the coast path and gaze down on secret coves. You can stay in the village and be content. There’s a shop for newspapers and all your essentials; a choice of two pubs, The Ship and the Pentre Arms; the essential fish and chips and ice creams of your dreams. But the focal point of Llangrannog is the beach, a sandy expanse for sunbathing, playing beach cricket, picking up shells, picnicking and running shrieking from dark and dripping caves. Ebb and flow permitting, you can wander round to a second and sometimes even a third secret beach (don’t be caught unawares by the rapidly returning tide). The village is sheltered at the mouth of a valley. But climb steeply to either side of the village and the path is a delight for walkers, giving a fine view of sea birds, a seal or dolphin if you’re lucky and the sun setting in a golden haze over the sea. Hop on one of the buses which pass through the village each day and it’s a one-way wander. 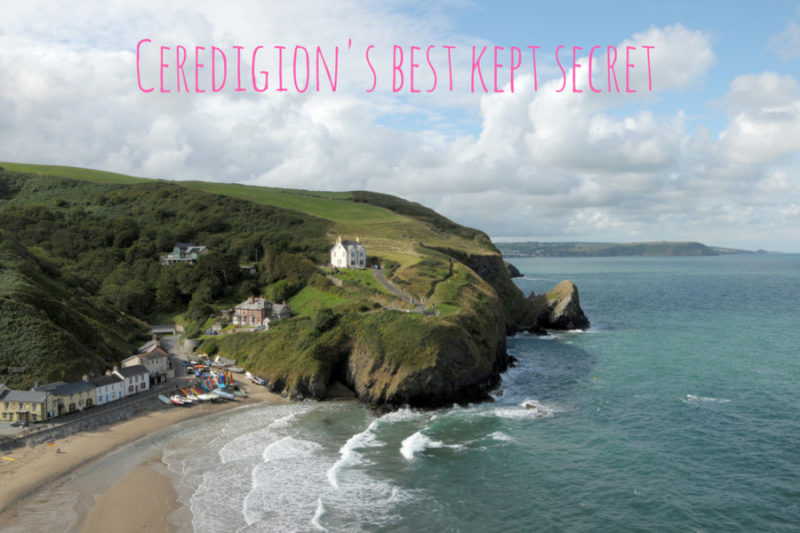 Venture further afield and the Ceredigion coast has lots to explore. The town of New Quay in Cardigan Bay was once home to Dylan Thomas, maybe his ‘cliff-perched town’ in Under Milk Wood. You’re likely to spot seals and dolphins on a boat trip from the harbour, or take a mackerel fishing boat and bring home your catch for the evening barbecue. Mwnt is a holy site, special for its chapel, a tiny 14th century building that was once a haven for medieval pilgrims and still has a very special atmosphere. The beach below is small too, but has been voted one of Europe’s top 10 loveliest, hidden beaches. Whether your vision is sitting peacefully on the beach creating a watercolour of distinctive Carreg Bica rock, a tooth spat out by the giant Bica, or catching some waves before enjoying a cold beer outside the beachside pub, this may well be the coast of your dreams.